Another season, another opportunity to decry English football's cup competitions. If there isn't a plan to meddle with the format of the FA Cup because it "isn't working", there must be an apparent (to some) groundswell of opinion proposing the scrapping of the League Cup. Or, if it's this season, both. Sadly type the words "scrap league cup" into Google and it reveals posts on internet forums of clubs such as Bolton and Arsenal, several general football forums and bizarrely a Celtic forum. The proposal on the latter being to scrap English and Scottish League Cups for an Anglo Scottish Cup. What, like the Anglo Scottish Cup that gave me one of my first live football watching experiences - Sheffield United v Grimsby Town? Quite frankly, I find these kind of proposals ludicrous. Ideas from footballing authorities who seemingly have little idea of how to run the game, little idea of how to apply a moral and professional code of conduct and are more than happy to ignore their own internal rules when the occasion suits. Ideas subsequently stirred up by a media happy to sensationalise such proposals as a disappointing change in times, yet at other times revel in the avaricious world of modern day football. Many claim there is no need for a secondary cup competition, it places an unnecessary burden on over-worked players and detracts from other priorities. This will be the same clubs who are more than happy to use "free weekends" and international weeks to take the players off on long flights for warm weather training or behind closed doors friendlies. Do I have any sympathy for Spurs and Jermaine Defoe? Not much. No one complained about the League Cup in the 70's and 80's when there was a proliferation of other knockout distractions that clubs seemed content to participate in; the Watney Cup, the Anglo Italian Cup, the Anglo Scottish Cup, the Full Members Cup. All short-lived, but all sitting alongside the two primary cup competitions. Granted football is different now, not necessarily for the better. You can finish fourth and enter the "Champions League" with it's bloated group stages and an enforcement for season ticket holders to buy tickets. As for the Europa League…. So who does the League Cup operate for. Well, firstly, the members of the organisation who runs it. Although the two legged early round matches were scrapped, this has probably provided a greater opportunity for small club progression. More likely to gain a result in a one off game than, have a great 90 minutes and then get soundly beaten a week later. 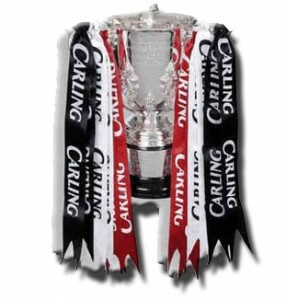 If anything the Carling Cup run was more memorable than the FA Cup run that season, victories over Palace and Sunderland and two goals in the final 3 minutes to come from behind to beat Leeds. 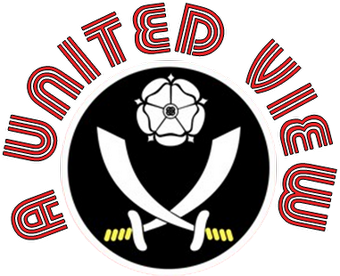 Happy days, thrilling nights, the spectacle enhanced under the glare of the Bramall Lane nights. So it is good for the Football League, but there is a case for saying that it is good for the Premier League teams too and not just those outside the Top 6. 7 years ago I visited Cardiff, ostensibly as a neutral, but in reality supporting my wife's team Bolton Wanderers as they played Middlesboro in the Carling Cup final. It was a great occasion, witnessed by the real supporters of both sides. Not just a day out at a cup final, but a match where everything was up for grabs....the cup, the prestige, a place in Europe in a hugely competitive match. This is the same prize Birmingham earned on Sunday. I don't particularly like Birmingham as a club, their success didn't please me in the way other "underdog" victories have, but fair play to them. They picked strong line ups and beat three Premier League teams on route to the trophy. It was deserved. Although I may dislike the Mr Creosote like UEFA Cup/Europa League "I'll have just another wafer thin excuse for an extra group game or 4" there is no doubting the importance of the European competition in previous seasons to Middlesboro, Fulham and, this season, Liverpool. Granted not all gained there place from the League Cup. In fact, in a season where Liverpool's opportunities for success are so limited, you cannot help but feel they may regret their defeat on penalties to Northampton in round three. The detractors point to low crowds, but times are hard, the cost of watching football is high and people prioritise. 46,000 people still saw the worth in watching Manchester United beat Wolves back in October. Well below capacity but still significant numbers. Any additional match is an additional cost that gets harder and harder to swallow. They say that the so called big clubs will rest players, blood the youngsters, but the very same clubs are just as likely to rest players and use their squad in Premier League games and sometimes it is not just the "big clubs"! Find me a club or a group of fans that don't want to play in a cup final, that don't want to win a cup. Arsenal fans were much derided for their rapid exit from Wembley on Sunday, a majority having left before their players had collected their medals, but to me that just exemplifies the importance of the League Cup. Yes, there was an element of disappointment in the manner of their defeat, but just as likely was significant disappointment in not winning the trophy - full stop. They might still have an opportunity to win 3 trophies this season and what most would consider to be more prestigious competitions. They might protest that, because of the other opportunities, actually the League Cup doesn't matter. I don't believe them. Their actions on Sunday speak louder than words.